Cheap Bungalows for long stay and backpacker in Klong Prao Beach. Three Seasons Bungalows in Klong Prao Beach on Koh Chang has comfy bungalows in a tropical garden with mountain view on Koh Chang Island. 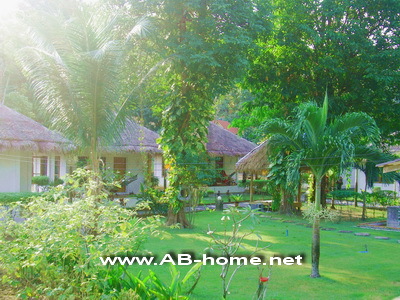 3 Seasons Bungalow is as well for long stay tourists and backpacker a cheap accommodation option on Ko Chang. This familiar accommodation is behind some small shops where you can drink coffee and buy something in a small minimarket. 3 Seasons Koh Chang is the perfect budget accommodation for long time tourists and backpacker who looking for cheap but comfy bungalows with bathroom and terrace in east Thailand. The main attraction near 3 Seasons Bungalow Ko Chang is the Klong Plu waterfall which is easy to reach by motorbike. For booking and reservation of Koh Chang bungalows follow this link.